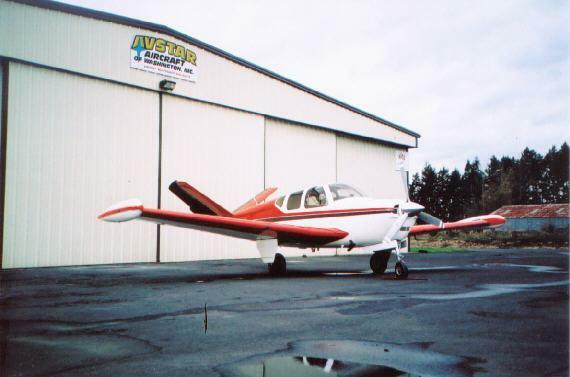 Beechcraft H35 Bonanza instrument panel spruce up | AVSTAR Aircraft of Washington, Inc.
Mid-life crisis to a 47 year old airplane? Must be time to spruce up the ol' H Bonanza! A guy knows that his Bonanza is behind the power curve; the pressure carbureted 470-G and Beech 278 prop keep on ticking. During the 15 or so years of ownership, the front engine mount structure cracked; instead of repair only, he upgraded to the beefier mounts needed with eventual more power, but the O-470-G stayed. The instrument panel needed help; he took the bird south several years ago and got a new panel installed. I advised him last year the windows, especially the windshield, were going to need replacing soon, but the powerplant kept on ticking along. The engine came out, nacelle cleaned, repaired and detailed. The front of the upper cowling doors repaired. A factory-fresh IO-470-N was installed with the D’Shannon baffles. Generator was scrapped for an Inter-Av alternator system. Single point EGT out; JPI EDM-700 with EGT, CHT, Oil and Outside Air Temps., and Fuel Flow were in. All windows out; all new D’Shannon windows in, including 3/8” speed-slope, and 3/8” forward side with inward opening vents. Beech 278 prop gone; installation of Hartzell Super-Scimitar completed. How about more fuel and / or useful load; installation of the Osborne tip tanks was performed with the D’Shannon transfer system, including push-button quantity indication, and ‘pump-on’ indicators. Clean up the paint lines a bit and color in the new parts. Has to be a different airplane! 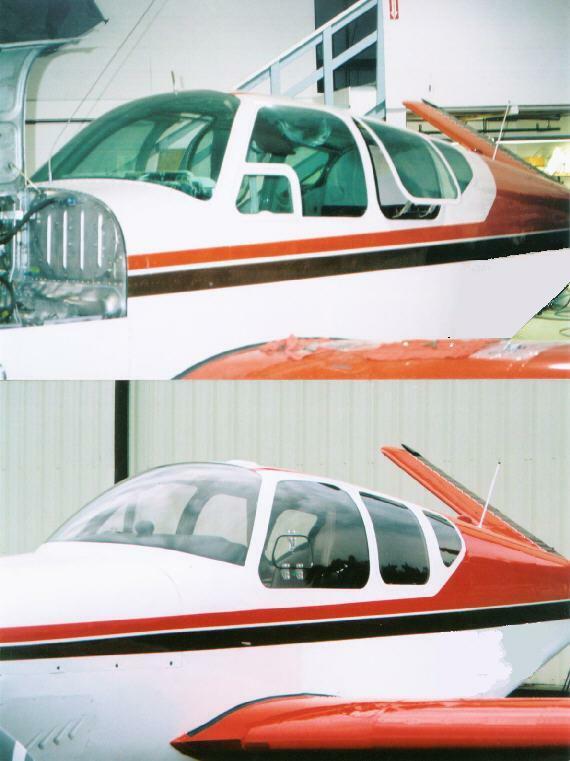 New lines with the tips, windshield, prop & spinner give the classic Bonanza a new outlook for the next 47 or so years. The owner is a very happy man, and the Bonanza is over it’s mid-life crisis!